1. I published and launched my first book! The book is about the Joyful Mysteries, which pairs up every prayer of the Joyful Mysteries with beautiful classic artwork! It’s available online at Amazon, Barnes and Noble, and Books-A-Million…. which, honestly, is kind of a dream come true. I cannot tell you how much, as a young girl, I wanted to be a published author. So just typing my name “Karina Tabone” into those sites and seeing my book come up is still an amazing thing. In a million years, I wouldn’t have imagined how amazing it is to be able to do that. And now, as someone who is a little older and hopefully a little wiser, it thrills me even more that it is such a beautiful book that glorifies God in such a special way. After all, the pictures that I’ve chosen for every prayer are gorgeous and I really do think that they bring you into a deeper reflection into the Joyful Mysteries. 2. I had my first book event! Me giving out bookmarks at my former home parish! 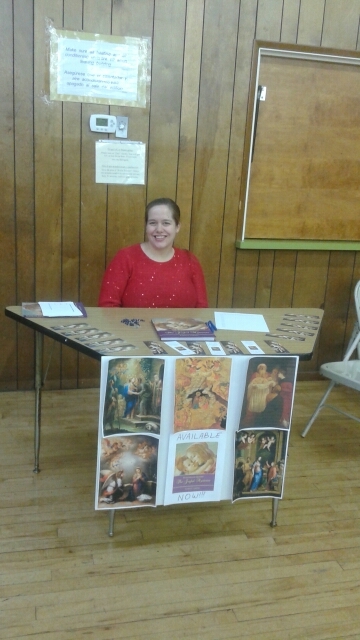 My first book event was at my former home parish (which is a special parish, as I got married there and attended there when I was in college) I gave out beautiful bookmarks, showed off my book, and met quite a few fantastic people! So that was an absolutely marvelous experience, and if you’re coming to my website for the first time from Holy Rosary, a huge welcome to you! 3. I introduced to several people on how to pray the Rosary for the first time through my book. This… is definitely the best thing about this week. The Rosary has had a huge presence in my adult life, though it wasn’t something I learned how to pray as a child. In fact, I honestly still haven’t memorized the Apostles’ Creed. So, when I made the book, not only did I make sure to go prayer by prayer through the Rosary (starting with the Sign of the Cross!) so that the structure of the Rosary was always present throughout, but I also made sure that, at the very end, there was a little how-to section on how to pray the Rosary, just in case you were totally new at praying the Rosary and needed just a little more direction. Anyway, as some people flipped through the book, they paused at the very end, which has that how-to section, and they told me, “I never knew how to pray the Rosary before now, but now I understand.” And that was just so… wonderful. When I made this book, I hoped to make the Rosary accessible to even those who were absolutely new to the Rosary. And now I am getting confirmation from other people that they are understanding more fully the beauty of the Rosary because of the book. And let’s face it: that’s why I made this book. Anyway, for all those I’ve met this week and for all those that I have yet to meet: thank you so much for an exciting week! This project has been a wild ride, for sure, but all of you make it worth it, and I thank you from the bottom of my heart. If you’re interested in taking a look at the book, you can take a peek here! Or, you can buy it on Amazon, Barnes and Noble, and Books-A-Million.